Next week we’re beginning our latest series. It’s called: Dream. Invest. Yield. The ABCs of DIY. We’ll also be giving away a Kindle Fire and a two-year subscription to Do It Yourself magazine. Stay tuned for the series and giveaway details! Your DIY CRM can be G2G (that’s “good to go” for those of you who don’t speak text message). Learn How to Create a DIY CRM System with Google Docs. Is it Kate Upton? Can it be? Check out The New Business Model for Corporate Meetings. Don’t come between a man and his nachos. AKA, you’re not gonna like a social networking manager when he’s angry. Hear my Hugo’s Tacos Woes: A Broken Autoresponder = Customer Disconnect. Since starting here at Benchmark I’ve made many friends whom I’ve never met. I did it with Blogging: The New Professional Networking Event. Even our sales manager was happy to see email being used for reasons other than selling. See how Woodridge Elementary Uses Email Marketing to Get Out the Vote. Just think, there is no spoon. Learn How to Naturally Integrate Keywords into Your Online Content. Make sure your SEO is hitting the gym. See the 5 Things You Should Be Doing to Strengthen Your SEO. Winter is coming. I’ve never seen the show, but I see that a lot in reference to it on Facebook. It may or may not apply to these Leadership Lessons from Game of Thrones. Take that mom and dad! I’m finding a way to put my journalism and music degrees to good use. Here is Your Benchmark Email Valentine’s Day Playlist. Yup. I’m rubbing it in. Yet another example of college tuition well spent. Check out the Benchmark 5: More Songs for Your Valentine’s Playlist. 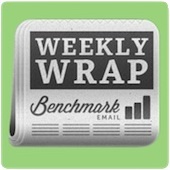 Shed Manly Tears for The Weekly Wrap!